Antarctica is not only a valuable place to conduct research about the Earth, its climate and its geological history; it's also a good place to learn more about our solar system and its history. The massive ice sheet covering Antarctica and the continent's relative isolation from human development make it an ideal place to search for meteorites. Steven Goderis from the Department of Earth System Sciences at the Vrije Universiteit Brussel (VUB) and Ghent University's Department of Analytical Chemistry took part in an expedition to search for meteorites as part of the 51st Japanese Antarctic Research Expedition (JARE 51). Before starting his Antarctic adventure, Steven took a few moments to speak to SciencePoles about the research he will conduct. What's going to happen during this year's field expedition? The group I'm going to be involved with will search for meteorites in the eastern Sør Rondane Mountains in Antarctica. I'm going down on the Shirase, the brand new icebreaker to be used on Japanese research expeditions. Having left on 24th of November from Fremantle, Australia, we should be arriving somewhere around the 26th of December. Once we disembark, we'll head to the eastern Sør Rondane Mountains, where a logistics specialist from the Belgian Army, Sgt. Maj. Jesko Kaczynski, will be meeting us with some tractors. From the Japanese side there will be two scientists, Prof. Dr. Hideyasu Kojima and Dr. Hiroshi Kaiden from the Japanese National Institute of Polar Research (NIPR), two technical assistants and a doctor. Depending on the weather conditions, we might be in the field looking for meteorites for three to four weeks during the month of January. Based on the recovery of previous missions, we should be able to find at least 100 meteorites, which would constitute a successful mission. Why is Antarctica such an important place to look for meteorites? Every year, something like 30,000 - 40,000 metric tons of meteorites fall to Earth. The majority of them burn up in the atmosphere; only the larger pieces make it through, and they accumulate equally all over the Earth's surface. However there are advantages to looking for them in Antarctica. Firstly, you can find them more easily due to the colour difference between the clear ice and snow and the dark-coloured meteorites. There's also a process by which meteorites are collected in the ice, particularly in blue ice fields. These blue ice fields are pushed against obstacles such as nunataks as the ice migrates, and then the katabatic winds erode the upper layers of the ice and the meteorites become exposed. The major benefit of the Antarctic meteorites is that they are extremely well-preserved. The time a meteorite has been on Earth ranges from very recent to a couple of hundreds of thousands to as much as two million years. Most meteorites weather quickly under the oxidizing environment of the Earth. However some meteorites fall at more fortuitous locations (such as the ice fields of Antarctica) and are preserved. So this is why scientists go to Antarctica to look at meteorites. Of the approximately 30,000 meteorites currently in museum collections around the world, two-thirds of them come from the Antarctic. In fact it was close to where the Princess Elisabeth Station currently stands that a Japanese expedition discovered the first Antarctic meteorite in the 1960s. How did the cooperation between the Belgians and the Japanese come about? Belgian and Japanese cooperation in glaciology dates back more than four decades. This most recent collaboration involves the exchange of scientific knowledge and materials, given the Princess Elisabeth Station is ideally situated very close to an area known to be rich in meteorites. This led to a collaboration in which a Belgian scientist (myself) would be allowed to take part in the JARE 51 mission and keep part of the meteorites collected in exchange for receiving logistical support from the Belgians. How were you selected to partake in the JARE 51 expedition? Prof. Philippe Claeys is my thesis advisor at the VUB, and he asked me if I wanted to go. We both understand the exceptional chance that this expedition offers. Is this the first time Belgium has done this kind of meteorite field research? Yes. Our group is specialized in impact craters, which are created by the bigger meteorites that have hit the Earth throughout its geological history. We study these terrestrial impact scars to determine what type of meteorites have hit the Earth, and by comparing them with the current meteorite population, we see if the composition of these meteorites has changed over time. There are a few more Belgians who have been working on meteorites, including Vinciane Debaille from the Université Libre de Bruxelles (ULB). She's just returned from a post-doc in the Lunar and Planetary Institute (LPI) in Houston, Texas. And now she's come back to Belgium to continue her work on meteorites. Belgium has a collection of meteorites at the Royal Belgian Institute of Natural Sciences in Brussels, and in recent years has acquired some nice new pieces, including some of the very specific and strange meteorites we're interested in the most (non-magmatic iron meteorites, lunar and Martian meteorites). Hopefully our first expedition can bring back some new and interesting meteorites to complement the collection. Meteorites are extremely diverse and have a wide variety of classifications, including ordinary chondrites (stony meteorites similar to the first solid to have formed in the Solar System), carbonaceous chondrites (the most primitive meteorites similar in composition to the original material of the Solar nebula), iron meteorites (similar to the core of the Earth) and achondrites (stony meteorites made from the same material as the Earth's mantle). All these meteorite types represent the entire range of solar system environments and processes from the first condensation of solids some 4.56 billion years ago to planetary formation and differentiation including the formation of a core, mantle and crust. Of course not all bodies had the chance to develop into large planets, and some even broke up again and accumulated in the asteroid belt between Mars and Jupiter. What solar system processes do these meteorites represent? In solar nebulae, you have all sorts of compounds and they follow a condensation sequence depending on their distance from the Sun. The first things to condense out of nebular gas are minerals that melt at higher temperatures, followed by those that melt at lower temperatures (these form at greater distances from the sun). Volatile compounds such as ice and water are the last things to condense very far away, in the region of the large gas planets. Small bodies form first by accretion of fragments of various sizes, and then some of these accrete further to produce a few larger bodies several tens to hundreds of kilometres across. Their further growth into a large planet is accompanied by to the evolution of a crust, a mantle and an iron-rich core, as in the case of Planet Earth. By studying meteorites, we can understand not only the evolution of the solar system but also that on planets such as Earth, Mars or the Moon. There are a large number of regions and different environments in solar nebulae where all these different processes take place. So in principle, for each type of environment and process that exists at a certain point in the solar system, you should be able to find a representative meteorite. How do these meteorites eventually end up heading towards Earth if asteroids in the asteroid belt are in a relatively stable orbit around the sun? Well, the key word here is relative. You have all kinds of forces at work within the solar system. The different planets interact with each other gravitationally creating resonances, and sometimes under the influence of these forces, asteroidal collisions can occur and as a result material can be sent into Earth-crossing orbits. How far back have some of these meteorites been dated? All the way back to the beginning of the solar system. Using specific isotopic systems (for example radioactive decay from uranium to lead), radiometric dating of different types of meteorites has shown that these objects formed around 4.56 billion years ago. As astrophysical considerations require that the formation of the planets and meteorites by condensation from the solar nebula was essentially simultaneous. Consequently, the age of the most primitive meteorites is inevitably also the age of the formation of Earth and other planets. A lot of meteorites date back to only a few million years from the absolute beginning of the solar system. Are the meteorites you find in Antarctica typically the oldest since they're most likely to have been well preserved? Not really. It's just a matter of statistics. 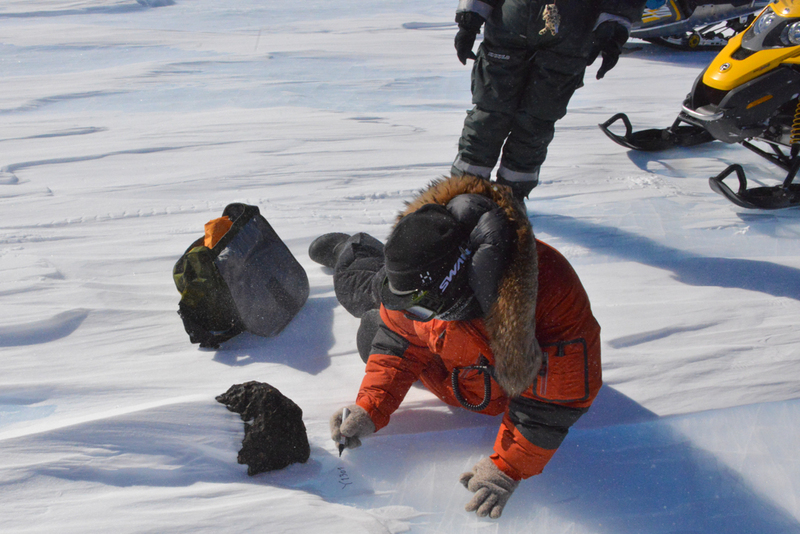 If you collect a large number of meteorites during a summer in Antarctica, you have a good chance of finding some of the less common and more primitive meteorites. The most common types of meteorites that can be found are ordinary chondrites, which usually make up 85% of all finds. These meteorites might seem a little less interesting, but you can learn a lot from them. The other groups like the iron meteorites, achondrites, and carbonaceous chondrites make up the other 15% of meteorites typically found, so if you collect 100 meteorites in the field, you have a chance to find 15 non-ordinary chondrites. Carbonaceous chondrites can tell us a lot about many of the process that took place at the beginning of the solar system, and iron meteorites can tell us about planet or asteroid core formation. Eucrites, another group of meteorites, can tell us about the parent body they originate from, a now broken-up planetoid called Vesta. So each meteorite has a different and interesting story to tell about various planets or bodies of our solar system. How can you tell where the meteorites come from? Besides petrological studies (which includes describing the mineralogical composition) the study of the geochemical compositions (major, trace and isotope analysis) can tell you a lot about their origin. Meteorites can be compared to the rocks collected on the Moon and those observed by robotic spacecraft on Mars. A technique known as reflectance spectroscopy can be used to determine the composition of asteroids and meteorites. Can you distinguish lunar and Martian meteorites relatively easily? Yes, because they're totally different from ordinary chondrites, iron meteorites or carbonaceous chondrites. It's easy to understand how meteorites coming from the asteroid belt would get to Earth. But how would something from Mars or the Moon get to Earth? They originated from a large impact that happened sometime after the planets formed. The debris from the impact can remain in space for a couple of millions of years before it crosses the Earth's orbit and falls to the ground as meteorites. These are some of the most interesting, and most highly sought after meteorites; if we were to collect one, it would make the news for sure. You say the meteorites collect around nunataks in Antarctica? Why is this? Well, as meteorites fall from space and are distributed across the Antarctic Ice Sheet, they get incorporated into this growing pile of snow and ice. But due to gravity this ice slowly flows out to the edges of the continent, where it calves off as big icebergs, which then take meteorites with them to the bottom of the ocean. However, in some areas, the ice is slowed down, forced to turn corners or pushed over buried peaks, exposing the ice to the harsh, dry katabatic winds of the polar plateau, which causes ice at the surface to sublimate. As the surface of the ice sublimes, the meteorites stay behind and gather together. The best place to look for meteorites is a blue ice field, which consists of nothing but clear, blue ice that has been thrust up from the deep. This ice is blue for the same reason why water is blue: the way water molecules (H2O) scatter blue light. What other research projects will be conducted during JARE 51? There are also two other Japanese missions going on this year in Antarctica. There will be a geomorphological survey to document the Cenozoic glacial history and global environmental changes and a geological survey to clarify the plate tectonic activity some 250 million years ago, when Antarctica was part of a much larger continent with Africa, Australia, India and South America. One team will be going to the Syowa Base and the other team will be going to the central Sør Rondane Mountains. Many of the team members working on these projects are already in Antarctica, and have spent time at the Princess Elisabeth Station. Steven Goderis is a researcher at the Department of Earth System Sciences at the Vrije Universiteit Brussel (VUB). His research ineterests include the detection and identification of traces of impacted projectile in terrestrial and extraterrestrial materials using relevant trace element abundances and isotope ratios. A laureate of the InBev-Baillet Latour Fellowship, Dr. Goderis was given funding to accompany a Japanese team searching for meteorites in Antarctica's ice.